It started when I was playing with Minnie when the Coyote appeared. She watched for a bit, and then started romping around as I threw the ball to Minnie. I tried to remain quiet and still and eventually she came down near us. I did not encourage any contact, and broke off play with Minnie and the coyote moved along. At no time did I feel threatened, same goes for our dog, who basically ignored the coyote. I first noticed this coyote when I saw her slipping down the hill as she tried hunting: she appeared not to have too much trouble in her battle against gravity, but I thought I would videotape it. Then she found a ball and discovered that she could use this gravity to help her play ball! She had a great time and put on an excellent show! To combat their loneliness and boredom, *loner* coyotes — those that have dispersed from their families and no longer have a social group with whom to be social or play — often create amazingly imaginative play and games. Doing so not only helps fill the time with fun, it also stimulates their growing bodies and minds and helps them grow into more innovative problem-solvers. Most coyotes that I know are happy critters. The video is a little long and becomes repetitive — I did not cut it because I wanted everyone to see how involved a little coyote could become in a game she herself invented. 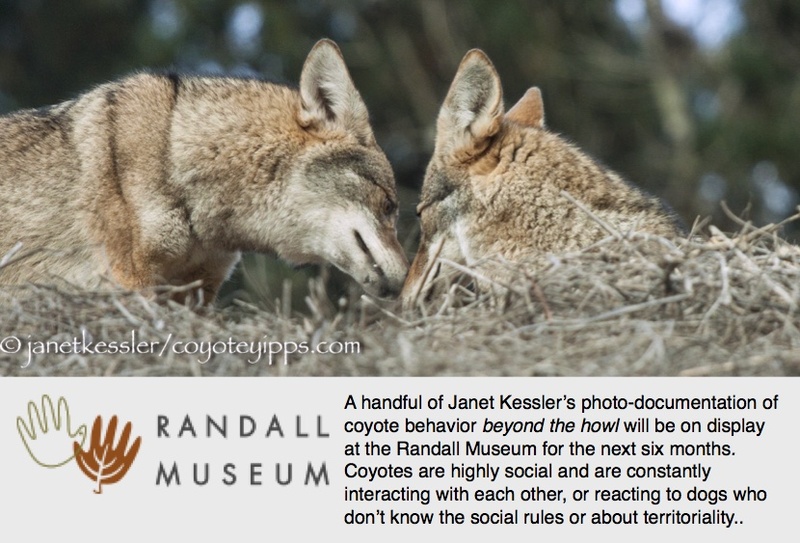 Coyotes are social critters. They mostly live in families and do things together. But when they are dispersed from their birth territories, they leave behind their intense social life for a while. They remain alone for a period of time as loners, transients or interlopers. During this time, they have no one from their own species to socialize with or to play with. Yet they are young, and we all know that youngsters need to, and like to, play. Observers have commented that there appears to be boredom and loneliness in their lives, and indeed I’ve observed the same thing. Coyotes are extremely intelligent and learn to fill their empty time with activities born of their active imaginations, be it play, or a *pretend* social life. Coyotes, like humans, play a good deal of the time. Their *play* is often *innovative* and may include playing, be it mildly or intensely, with found objects and sometimes treating them as prey. It may involve battling a stick alone because there is no one to play tug-of-war with — coyotes play among themselves this way all the time. It may involve curling up into a little ball and rolling down a hill clenching a ball or even its tail. It may involve caressing a ball and rolling with it on the ground. The need to socialize also continues. So*stand-ins* are found for *companionship*. The bill may be filled by simply watching dogs play with other dogs and their owners. It could involve approaching dogs playfully in the hopes of engaging on some level with them, if only to get a reaction. It may involve friendly *following* of a dog walker for a short distance. This video was taken by Jeff Garner who has two large dogs (100 pounds) which he walks daily. The coyote in the video, a young loner, knows them, and they know her: each knows the other’s moods and capabilities due to watching and some unexpected *chasing* when the coyote first came here. In this short video, the coyote tags along on a short section of the walk after approaching playfully. Notice that when something more interesting catches the coyote’s eye — movement in the grasses — she hurries over to examine what it is. She is not focused on the dogs as either threats to her, or to message them to leave her alone. No, she is following for nothing more than entertainment and company. I’ve seen other loner coyotes who play with a few selected and trusted dogs — something I wouldn’t have believed, except that I’ve seen it many times now. In all cases, the activity began by chance. Owners have reported to me repeatedly that the coyote was seeking company, and indeed, this appears to be so. Dog and coyote don’t ever really become trusted *buddies* for one another, rather it is a very short but friendly interaction. *The civilized and the wild* (or, should I say, *the civilized* and *the becoming civilized*), both sharing an urban environment, touch each other tangentially for a few moments before moving back to parallel worlds whose dictates keep them apart. Be this as it may, we counsel everyone to please not allow interaction. A coyote could very well end up nipping a dog — on the tail is not unusual. If a coyote approaches, leash your dog and keep walking away, as Jeff is doing in this video. Coyotes are wild animals, they can be unpredictable. Also, allowing your dog, who gets along with the coyote, to interact with a coyote may encourage that coyote to approach a dog who may not have the same feelings towards the coyote that your dog has. We’re trying to keep everyone safe, and feeling safe. Coyotes are happy critters. Each has a very different family situation, history and personality, so no two coyotes will ever be alike. Here is a playful *loner* coyote. She was *dispersed* from her territory and family a year-and-a-half ago and has not teamed up with a mate, so she is alone. Since coyotes are very social, what do they do when there is no one to socialize with — no family? How do loners spend their time? Many folks have commented to me that they see *boredom* and *loneliness* as driving some of their behaviors. Here is a video showing a loner coyote entertaining herself with a crackling water bottle. She treats it as though it’s dangerous prey. She seems to really *get into it*. I have watched this same coyote play with balls, dead branches, clods of dirt, tossed packaging. I have seen other coyotes play with these same things and also pieces of human clothing or dropped children’s toys. It’s always thrilling to watch and somewhat infectious! Many folks have told me that they feel as though the coyote was actually *performing* for the various onlookers, all of whom showed and expressed their delight at the coyote’s antics. Coyotes are superb at reading this kind of reaction, and may be spurred on in their play by it. Others see this play as *displacement behavior* of a very anxious coyote. Living in an urban environment creates continual stresses which may cause coyotes to *act out* some of their frustrations. In which cases are one and not the other going on? Or are there always degrees of both? Whichever the case is, we’re trying to create the conditions that make our urban environments as hospitable as possible for coyotes so that survival is not a chore for them. Please follow the guidelines by reviewing the video, Coyotes As Neighbors.